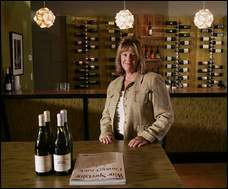 Marin resident Shawn Hall, who has designed several popular Bay Area and North Bay bars and restaurants, at her recent design creation, Generation Wines, a Windsor wine bar. Most restaurant redesigns cost big bucks. And when the restaurant closes, the new owner throws out all that expensive stuff and starts all over again. Bay Area designer Shawn Hall – queen of the salvage yard and pioneer of sustainable products like recycled resin and renewable palmwood – thinks that’s a shame. As an environmentalist, Hall has carved her own green pathway through the design world for two decades, taking on trendy projects with creative people who have big dreams but small budgets. In 1986, Hall launched her career by turning the shabby Phoenix Hotel in San Francisco into a funky urban oasis for stars like Keanu Reeves and the Red Hot Chili Peppers. She painted the bottom of the pool with squiggly question marks, an esoteric touch that gave the designer her own 15 minutes of fame. When Hall designs a hotel or a restaurant, she chooses natural colors and textures and often fabricates custom furniture out of found objects. She resurrected an 1880s carnival ticket booth as a hostess stand for Willi’s Wine Bar in Santa Rosa and redirected a church pulpit for a North Beach bar. Though she lives in Mill Valley, the office of Shawn E. Hall Designs is located in a 100-year-old blacksmith shop on Folsom Street in San Francisco. Hall builds furniture in a studio close to her office and works with fabricator Jann Eyrich of Windsor. Hall has designed two hotels, two retail spaces, seven offices and 22 restaurants in the Bay Area, including many of Sonoma County’s hottest dining destinations, from Monti’s Rotisserie in Santa Rosa to Willi’s Seafood and Raw Bar in Healdsburg and Taverna Santi in Geyserville. All of these restaurants feature architectural elements, colors and textures she has culled from her travels and captured with her camera. At Santi, Hall turned three separate spaces into one room by partially opening up two walls and inserting antique Tunisian grilles as separators. She took the redwood from the old bar and recycled it into a pergola to provide shade for a new deck out back. At Monti’s in Montgomery Village, the main challenge was bad space planning, with doorways that walked patrons into walls and a bar that seated only four, she said. To solve the problem, she repositioned the front door and took out a few walls. Then she added a rustic plank bar to the front, antique ironwork to the walls and a tile mosaic to the rotisserie, creating a casual, Mediterranean ambiance. At Barcode in downtown Santa Rosa – also owned by the Starks – Hall created a hip, cutting-edge cocktail lounge that is half Los Angeles, half New York. Organic elements, like palmwood and bamboo on the walls, bump up against sleek, modern furniture. A frosted white resin bar top, resembling ice, is streaked with brown, gold and blue stripes. When Ryan O’Harren first walked into Barcode, he liked the design so much he tracked down the designer and asked her to create a similar ambiance in his private tasting room/wine shop in Windsor. Generation Wines, launched last spring, is an ultracontemporary space that appeals to young, “œmillennial” wine drinkers, born between 1977 and 1985. For the wine shop, Hall chose a palate of soothing greens and constructed a custom tasting bar out of resin embedded with reed and richly textured Kirei board, a Japanese product made from recycled sorghum shells. She also created walls of resin cubes to hold wine and serve as wall dividers. Hall learned the importance of nature as a young child, walking the fields of her grandfather’s farm in the Ozarks of Missouri. Her grandfather, Leonard Hall, wrote a weekly conservation column and helped establish legislation to protect national waterways and parks. When Hall was 7, her family moved to Southern California, where she started her design career by helping her mother fix up funky beach houses for resale. Although the family never had much money, Hall always had the coolest room and wore the cutest clothes, thanks to her mother’s skill with a needle and thread. At UC Santa Cruz, Hall majored in environmental studies, then worked as a landscape designer for six years before being lured from the lawn into the lobby of the Phoenix Hotel, her first interior project. Currently, Hall is catching the “green” wave of the hospitality market by developing a new line of hotel furniture made from recycled products. It is expected to debut this spring. Meanwhile, the 50-something designer is working with an architect on her dream goal: a blueprint for affordable, green housing where baby boomers like herself can ease into their sunset years.